We listen and draw the key themes and ideas. Each presentation we capture will give your attendees a rich artifact of what they just heard. Logistics: handled. After one call with our team to review your specific objectives, we take it from there: we handle travel, supplies, and all the fiddly bits. Made ya look! During your event, we make visual notes that wow your audience, help them remember what they learn, inspire them to share your event while it happens, and continue to talk about your event after it’s over. Go beyond the venue. There are a dozen ways to use images post-event. Let us help you brainstorm ways to help your event’s ideas spread beyond the venue. Graphic recording of a keynote by Jamie Hyneman -- MythBusters co-host -- at the Advanced Manufacturing Expo and Conference. Attendees at Content Marketing World snap photos of the visual notes. 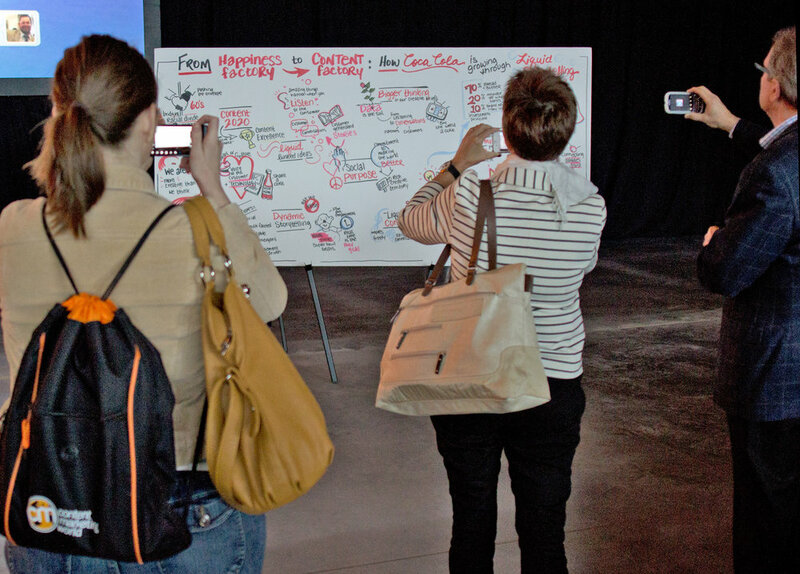 “Kingman Ink's visual notes are some of the most helpful things at the event. My CSO even suggested getting photos of them because they are so thorough. I love using the images when I present my takeaways from the event back to my team.” – Karen McLaughlin, Gain Inc. Speakers and attendees share visual notes on social media after the presentation.